Horqueta is the name of a town in East Paraguay about 25 miles (40 kilometers) east of the city of Concepción, which is located on the Paraguay River approximately 200 miles (320 kilometers) north of Asunción (coordinates: 23° 20′ 39″ S, 57° 2′ 0″ W). A narrow-gauge railroad, one of the few railroads in Paraguay, operates from Concepción through Horqueta to a few miles beyond. Hardly had the Russian Mennonites settled in the Fernheim colony in the Chaco when, for various reasons, some became dissatisfied and began to cast about for other places to which they might move. Early in 1931 a committee composed of Gerhard Isaak and a certain Langemann investigated several areas in East Paraguay including Horqueta where a few German-speaking families were already settled. Langemann recommended moving to Horqueta, but Isaak advised against it. In 1932 a few families, including Langemann's, moved to Horqueta and started a new Mennonite colony. Others followed in the next few years until about 20 families were located there. The group did not prosper, however. 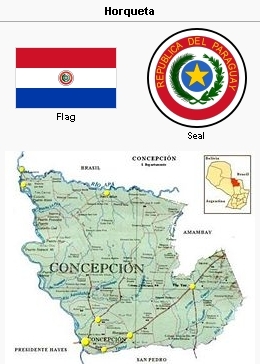 In addition to having some difficulties with Paraguayan neighbors, there was a lack of unity in the colony. Gradually families began moving away—some back to the Chaco, some to the newly formed Friesland colony, a few to nearby Concepción, and a few to Asunción. The last family moved away in 1945. Kliewer, Friedrich. Die deutsche Volksgruppe in Paraguay: eine siedlungsgeschichtliche, volkskundliche und volkspolitische Untersuchung. Hamburg: Hans Christians Verlag, 1941. Smith, Willard H. "Horqueta (Concepción, Paraguay)." Global Anabaptist Mennonite Encyclopedia Online. 1956. Web. 21 Apr 2019. http://gameo.org/index.php?title=Horqueta_(Concepci%C3%B3n,_Paraguay)&oldid=120286. Smith, Willard H. (1956). Horqueta (Concepción, Paraguay). Global Anabaptist Mennonite Encyclopedia Online. Retrieved 21 April 2019, from http://gameo.org/index.php?title=Horqueta_(Concepci%C3%B3n,_Paraguay)&oldid=120286.